Calipari’s Kentucky Wildcats are primed for a run at greatness this season. With a deluge of McDonald’s All-Americans on the roster, Coach Cal has been dominating with his platoon system, and even the loss of likely first rounder Alex Poythress cannot slow them down. After surviving their likely toughest regular season test on the road against Louisville, there has been serious talk that Kentucky could be the first team from a power conference to go undefeated in the regular season since the legendary 1976 Hoosiers team (UNLV, Wichita State and others were from decidedly weaker conferences). The SEC is not the ACC, but it is still an elite conference, ranked as 5th best in the nation. Postseason aside, can Kentucky produce a perfect season? Both models agree that losing exactly one game is the most likely result for the Cats, with two or three total losses also a realistic possibility. 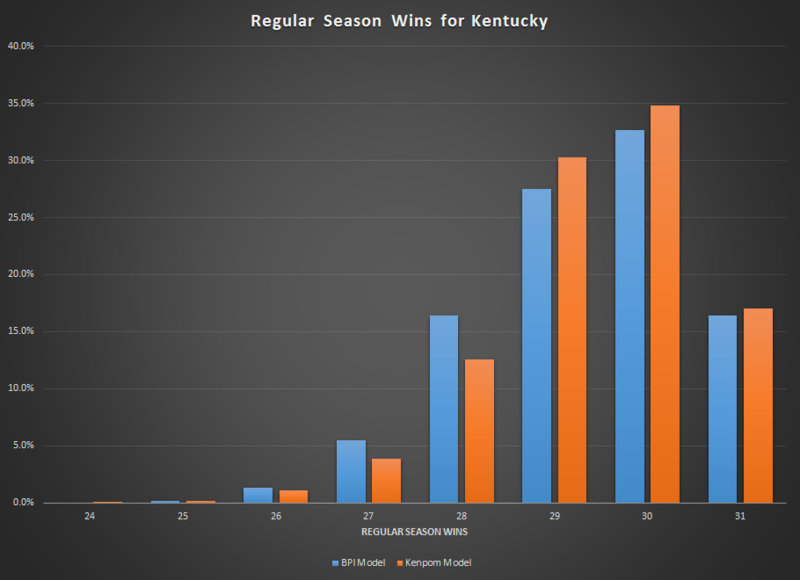 This isn’t to argue that Kentucky isn’t the best team in college basketball, at least since Anthony Davis’ Kentucky team and indeed perhaps they’re even stronger than that team due to their phenomenal depth (though that 2011-12 squad did have an absurd six players drafted into the NBA, with four in the first round). But to win every game, you just need a lot of luck. Random things happen – teams make too many threes, referees make blunders – and you need to be good and lucky to be perfect. It’s refreshing to see analysis that doesn’t hyperventilate. I agree that UK’s chances of an undefeated season are slim. Can you provide some insight into how you did the simulation? I’d love to see the details. Have you done a blog post on the technique?